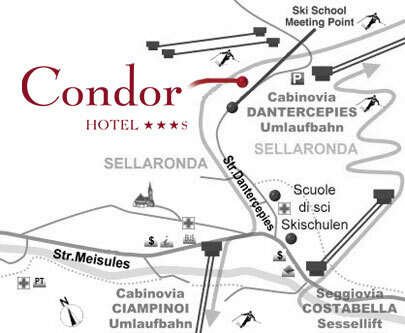 In the winter, the Hotel Condor is just 20 metres from the Sella Ronda and the practice slopes of the ski schools. Therefore ideal for beginners as well as experienced skiers and snowboarders. In the summer, our hotel is a first-class base for hikes and cycling tours in the Geisler Natural Park and the Vallunga. You can, of course, park your car for free throughout your stay in the hotel's private, indoor car park. By car: You can get to Selva by taking the A22 (Brenner highway) from Innsbruck-Brenner-Klausen (taking the exit marked Klausen/Chiusa towards Val Gardena), from where you'll reach Selva in around 25 minutes. By train: There are good Intercity and EuroCity rail connections from Germany, Austria, the Netherlands and Belgium via Munich -Innsbruck-Brenner to Bressanone (and sometimes to Chiusa or Bolzano), from where there is an almost hourly local bus connection that takes you straight to Selva.